The more you use your card, the more you'll get back in return. reward program and a host of other great benefits. Students can now get a VISA card that was designed with students in mind. The L'earn VISA* card offers a Moneyback® reward program and a host of other great benefits. As an example, if you were to put all of your spending on your card, and spent just over $200 per week on average over the course of a year (e.g., for books, tuition, transportation costs, utility bills or groceries), you'd receive a Moneyback reward of over $100 that year - which would be credited to your July VISA statement. You can also use your card to pay your bills - it's one of the easiest ways to maximize your Moneyback rewards without spending any additional money. It's almost like getting a discount on monthly bills you normally have to pay anyway. 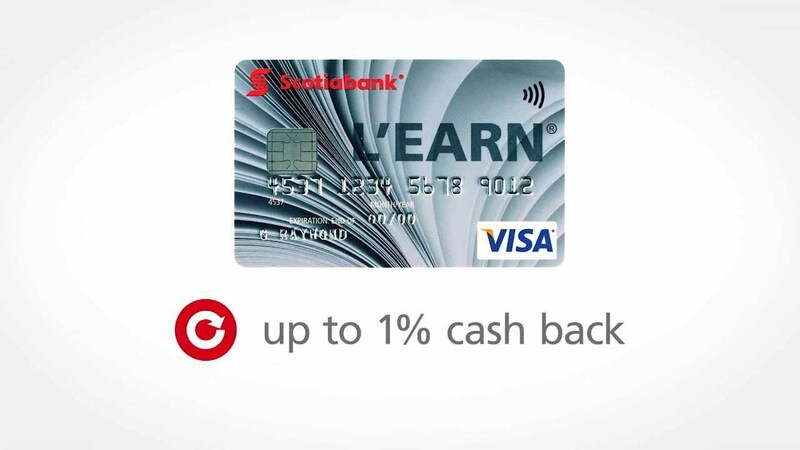 The L'earn VISA card automatically gives you a Moneyback reward of up to 1% on purchases you make with your card1. Low Moneyback reward tiers make it easier to earn even more rewards. A secured VISA option is available for Canadian citizens, landed immigrants, and foreign students. Ask at your local Scotiabank branch for more details. Simply present your L'earn VISA card at any participating location. Or visit www.AVIS.com or call 1-800-TRY-AVIS (879-2847) and quote the rebate number C030400. Link your L'earn VISA account to your ScotiaCard® and use TeleScotia® Telephone Banking and Scotia OnLine® Financial Services for VISA account information. My Mobile Wallet is now included with the FREE Scotiabank Mobile Banking app and lets you tap your smartphone on the terminal to pay. Just look for the Visa payWave™ symbol at the checkout. As a cardholder, you have flexibility. You’ll receive Scotia Credit Card Cheques2 for added convenience. And it’s easy to get cash advances. Pay for a large purchase, insurance premiums, medical bills, or utility bills. Over 1 million ABMs around the world displaying the VISA/PLUS symbols. Over 55,000 ABMs displaying the INTERAC symbol in Canada, including Scotiabank ABMs. Or, access your No-Fee ScotiaGoldVISA account with your ScotiaCard when you link the two together. With one simple application, you can have financial protection from a range of life events: Disability, Job Loss, Strike or Lockout, Critical Illness or loss of Life. A monthly benefit equal to 20%† of your outstanding credit card account balance can be paid to your credit card account if you are unable to work, which can help pay down your balance faster. In the event of a diagnosis of a covered Critical Illness++, or if you pass away, your outstanding credit card account balance can be paid in full, up to a maximum of $50,000. †20% of your outstanding credit card account balance for up to 10 months up to a maximum of $5,000 per month and a total maximum of $50,000 if you are unable to work due to involuntary Job Loss, Strike or Lockout or become disabled. ++Critical Illness, Disability, Job Loss and Strike/Lockout coverage terminates at age 70. Life coverage terminates at age 80. Scotia Credit Card Protection is a group insurance policy underwritten by Chubb Life Insurance Company of Canada. All coverage is subject to terms and conditions including limitations and exclusions which are outlined in the Certificate of Insurance which you will receive upon enrolment. Find helpful information on student programs, budgeting tools and scholarship opportunities. Purchase returns, payments, cash advances, Scotia® Credit Card Cheques, credit vouchers, card fees, interest charges or service/transaction charges do not qualify for a Moneyback reward. Not including cash advances, balance transfers and Scotia Credit Card cheques. Provided that you pay your balance in full by the payment due date. All Scotiabank retail credit cards, except ScotiaLine VISA card, Scotiabank Value VISA card, and No-Fee Scotiabank Value VISA card, will have Visa payWave when issued or reissued. Visa payWave™ is a Trademark of Visa Int./Lic.